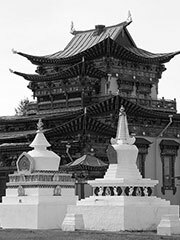 Datsan (Russian: Дацан) is the term used for Buddhist university monasteries in the Tibetan tradition of Gelukpa located throughout Russia, but concentrated in Eastern Siberia. As a rule, in a datsan there are two departments — philosophical and medical. Sometimes to them is added the department of the tantric practices where the monks studied only after the finishing education of the philosophical department. In pre-20th century Russia, datsans traditionally existed only in Buryatia and Transbaikalia. Datsans were officially acknowledged in the Imperial Russia in 1734. By statute of 1853 were recognized 34 datsans: two in the Irkutsk governorate and others in the Zabaykalsky governorate. The first datsan in Europe was Gunzechoyney datsan. It was built in St Petersburg between 1903 and 1913 and started to operate on 21 February 1913. Between 1927 and 1938 all 47 datsans, existed in Buryatia and Transbaikalia were closed or destroyed. In 1938-1945 no one datsan not worked. In 1945 was opened Ivolginsky datsan, several years later resumed his work Aginsky datsan. Only in 1991 were opened next 10 datsans.